Angelique Kerber of Germany returns a shot to Karolina Pliskova of the Czech Republic during their quarterfinal match of the Pan Pacific Open tennis tournament. 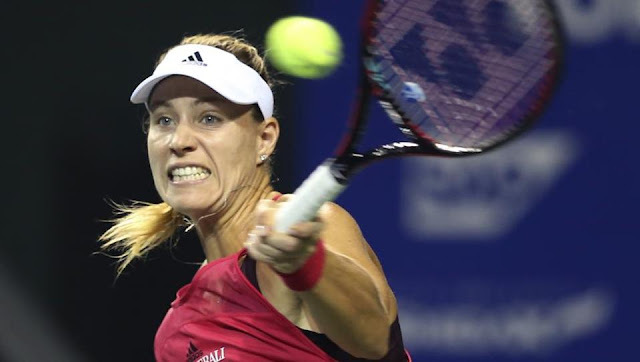 Former world number one Angelique Kerber won a war of attrition with second seed Karolina Pliskova on Friday to reach the semi-finals of the Pan Pacific Open. The German, seeded seventh and a former Tokyo finalist, came through 7-6 (7/5), 7-5 as she repelled some brutal hitting from her Czech opponent in a contest of real quality. Pliskova, who herself briefly held the women’s top ranking over the summer, produced moments of brilliance at the net but ultimately crumbled under relentless pressure from Kerber. One of her eight double-faults gifted Kerber the first-set tiebreak 7-5 before Pliskova unravelled again at the business end of the second set. Kerber turned the screw in the 12th game, forcing Pliskova to save four match points before delivering the coup de grace with a vicious, dipping backhand that landed on the Czech’s shoelaces, giving her no chance. The 29-year-old Kerber, who has slipped back to 14th in the world since winning last year’s Australian and US Open titles, faces Anastasia Pavlyuchenkova in the last four. The Russian advanced by overcoming another Czech, Barbora Strycova, 5-7, 6-3, 6-1. Top seed Garbine Muguruza, playing in her first tournament since reaching the top of the women’s world rankings, faces France’s Caroline Garcia in the third quarter-final. Defending champion Caroline Wozniacki takes on Slovakia’s Dominika Cibulkova in the late match.